Matrox Indio offers 8 discrete inputs and 8 discrete outputs that are jumper-selectable for 24V or TTL-level signaling, supporting both factory-floor and lab use. The I/Os are optically isolated while the outputs are also protected by resettable fuses, all to prevent damage from unintended use. The I/Os can be hooked up in either sinking or sourcing configurations and are accessible from a standard 37-pin D-Sub connector. Matrox Indio delivers real-time I/O management through a dedicated hardware-assisted mechanism. The mechanism enables output events to occur at precise moments in time, based on elapsed time, or specific input events. An input event can come directly from a discrete input, including from a rotary encoder, or a count derived from a discrete input. Programmed output events are stored in a hardware list, which is traversed based on a clock or an input event. The carrying out of an output event results in a state transition, pulse or pulse train on a specific discrete output. Multiple cascadable hardware timers are available to count or generate specific events. 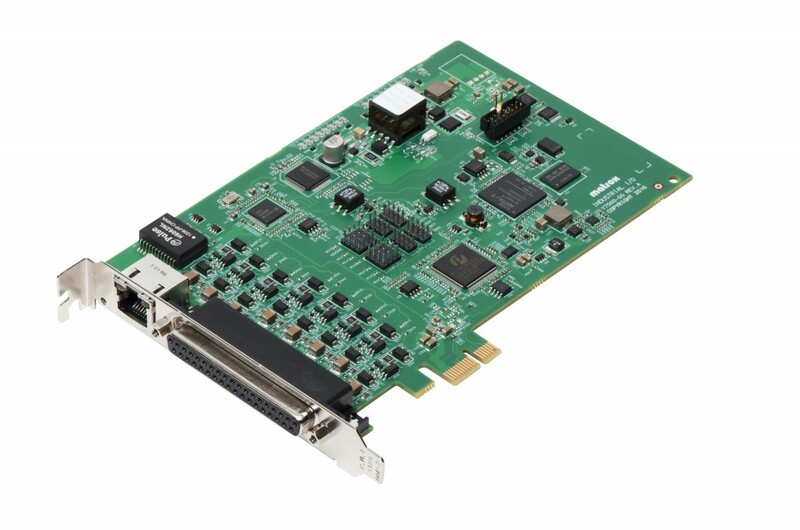 Matrox Indio also makes available a Gigabit Ethernet port through a standard RJ45 connector for industrial networking using the EtherNet/IP™, Modbus® and PROFINET protocols. PROFINET communication is hardware-assisted to ensure timely response. The Gigabit Ethernet port can alternatively connect to a GigE Vision® camera and power it by way of PoE support.